As author Dov Seidman has written, the world craves genuine leadership – leaders with moral authority who have the ability to elevate us and enlist us in a shared journey. 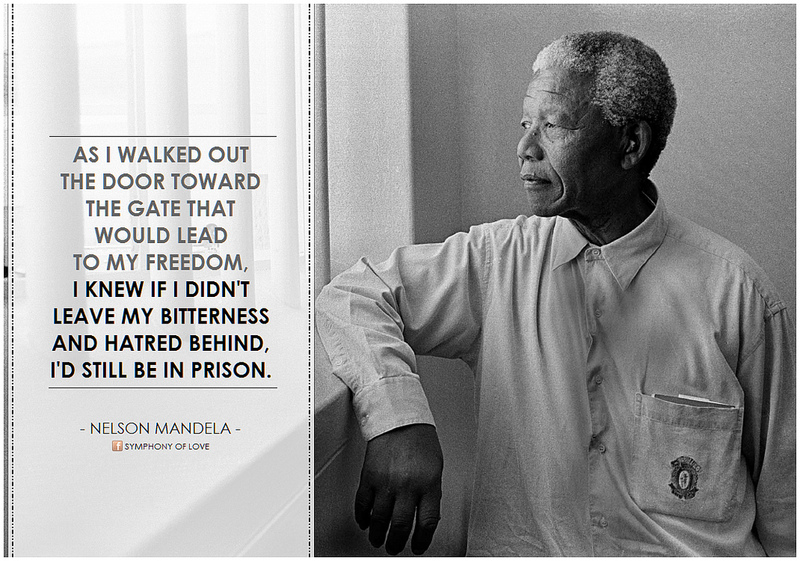 Nelson Mandela was such a leader. And he was such a leader precisely because his behaviour was the antithesis of psychopathic leadership. The greatest murders in history all had a grand compelling vision. For Hitler, the vision was of a unified Europe under German rule. Stalin’s vision was of a modern industrialized Russia in command of a wider Soviet empire. For Mao, the Vision was of a China united under Communist rule forging a new society free of economic inequality. These visions however were all the visions of psychopaths. They were all based on simplistic and defective views of humanity, and on the pathologically narcissistic self belief of the leaders concerned – Hitler’s tragically erroneous view of Jews, Stalin and Mao’s equally tragically flawed belief than human nature could be permanently recast through the use of terror. Following his release, decades later, he wrote ‘In prison my anger towards whites decreased but my hatred for the system grew.’ Once elected president, he held true to the democratic vision to which he had committed his life, and set about changing the oppressive apartheid system into one in which psychopaths could never again thrive. The rule of psychopathic tyrants is characterized by the methods they use to achieve their narcissistic visions. The key clinical feature of psychopathy is a total absence of regard for other human beings. Psychopaths regard other people in simple instrumental terms – as things to be used and eliminated as they see fit. The suffering of others – even suffering on a monumental scale – is of zero consequence to them. Violence and terror are therefore the primary instruments of psychopathic leaders; the needless deaths of millions of people are their principal legacy. In stark contrast, Mandela’s vision did not require the defeat and annihilation of others. His methods were not violence and the oppression of enemies, but the democratic processes of negotiation and compromise. Mandela insisted that white South Africans were to be accommodated, not conquered. He recognized that forgiveness, not blood-letting, was the only way to build a new democratic South Africa. In contrast to psychopathic leaders, who are masters at whipping up paranoia against enemies, real and imagined, Mandela showed real leadership in those moments when he faced down his own supporters desire for vengeance to emphasise the humanity of his opponents. The regimes of psychopathic and narcissistic leaders are characterized by monumental lies and breathtaking hypocrisy. Leaders who murdered millions are celebrated as caring fathers of the nation. The tyrants preach freedom while they keep their people in ignorance and servitude; the tyrants grow fat even as their citizens starve; the tyrants espouse fairness and equality as they amass untold wealth through coercion and corruption. When he gained power, he acted upon the principles he believed in. He invested his authority in building the institutions of state, the rule of law, and a constitution, that would be greater than any individual. He acted to empowerment civil society and the press so they would be better able to hold leaders to account. As a result, when Mandela made powerful gestures of reconciliation, such as inviting his jailer to be a guest of honour at his Presidential inauguration, people knew they were authentic, because they reflected the reality of the man. Many of the eulogies following Mandela’s death have lamented the passing of a unique leader whose likes we seldom see and are unlikely to see again. Such assessments are both dangerous and inaccurate. Force of personality and charisma undoubtedly played important roles in Mandela’s success. But the essence of Mandela’s appeal lies in something beyond Mandela himself – in the vision of a peaceful, inclusive, democratic world in which, in his words, never, never and never again would this beautiful world see the oppression of one by another. As others have said, this vision was not a spontaneous miracle emanating from the magnificence of Mandela’s soul . Rather it is a vision which previous generations the world over have created through an often violent struggle with psychopathic elites. It is also a vision for which countless millions around the world continue to suffer – languishing in prisons, enduring torture, and risking and losing their lives. We cherish Mandela because he was one of us, one of the psychologically normal majority of humanity. He wanted the things we want. His values are our values. His aim was not to use us for his own ends, to lie to us, or top enslave us. His was to see us as his equal and to urge us to work together to create a society in which all of us can live as fully as we dare. Mandela was great because he was human, and because he believed passionately in democracy. In this he was not unique. Our greatest hope for a better future lies in the fact that there are billions of us just like him. This entry was posted in Building a Better Future and tagged apartheid, Chris Hani, corrupt politicians, Desmond Tutu, good and evil, mandela and leadership, narcissistic leaders, Nelson Mandela, psychology of power, Psychopaths by Ian | disorderedworld. Bookmark the permalink. The image of Nelson Mandela as a selfless, humble, freedom fighter turned cheerful, kindly old man, is well established in the West. If there is any international leader on whom we can universally heap praise it is surely he. But get past the halo we’ve placed on him without his permission, and Nelson Mandela had more than a few flaws which deserve attention. Nelson Mandela was the head of UmKhonto we Sizwe, (MK), the terrorist wing of the ANC and South African Communist Party. At his trial, he had pleaded guilty to 156 acts of public violence including mobilising terrorist bombing campaigns, which planted bombs in public places, including the Johannesburg railway station. Many innocent people, including women and children, were killed by Nelson Mandela’s MK terrorists. … and there is evidence that Mandela beat his first wife and cheated on her. He is being described as a perfect public figure. His smle was almost too perfect. People who were close to him also said that he was a womanizer. He changed his mind quickly when he found out that following another opinion was more promising. Family members accused him of putting politics before everything else. When he was in prison, he managed to gain the prison officers’ trust. (Manipulation!) They were like his personal guard. In a letter to his wife Winnie, he wrote that he had put on a mask. I understand that that’s what helps you survive prison BUT “wearing masks” is also often associated with psychopathy. I think there are many signs in his behaviour that point to psychopathy. What keeps my hope alive is that he might have changed at least a little bit during his time in prison.